Google's new Wifi mesh router is going to become available on December 6. The device was announced in early October at the company's big hardware event, and it's the third Google-branded wireless router so far, following the two OnHub models from a while back - one made by TP-Link, the other by Asus. The Google Wifi doesn't have any co-branding, on the other hand, which isn't surprising if you look at the Pixel phones where the same thing applies. The OnHub routers will work with Google Wifi, as previously revealed, you can add a Wifi to extend the network created by your OnHub. 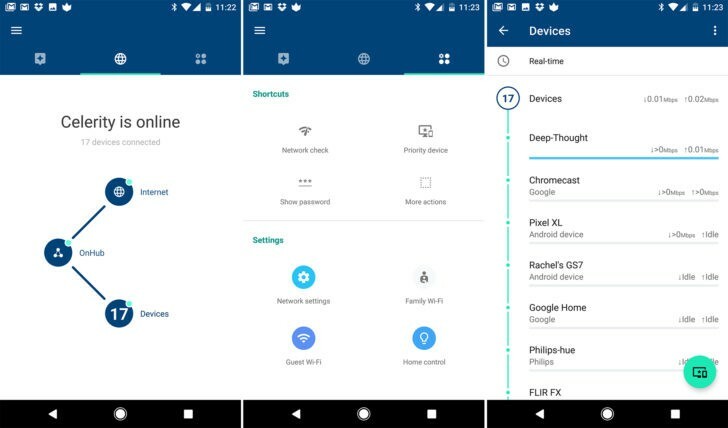 To get ready for the Wifi's launch, Google is rebranding the On app, which has so far been used to control the OnHub routers. This will be known as Google Wifi from this point on. The update that changes its name is currently undergoing a staged rollout through the Play Store. Aside from the new branding, it also comes with a UI revamp of sorts. There are three tabs up top that give you quick access to various features, and there's a new icon too of course. The new Family Wifi Pause feature is in as well, letting you disable internet access on certain devices on a schedule. You can naturally still manage your OnHub from the updated app.